Ever seen an empty swimming pool and thought, “Gee, what else could I do with this eyesore?” Me neither. But Dennis and Danielle McClung, the founders of Garden Pool, had a novel idea. 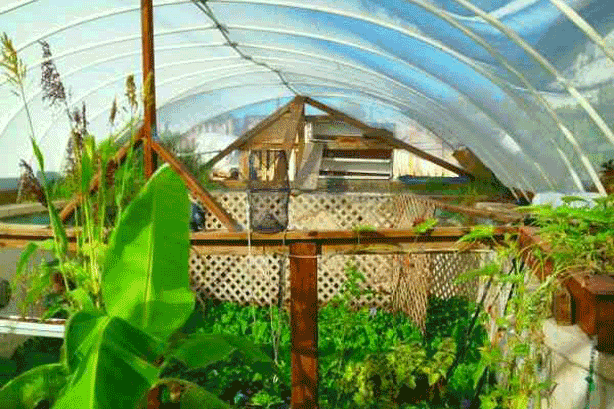 After buying a foreclosed home in Mesa, Arizona with a pool that needed costly major repairs, they came up with a solution: transform it into a permaculture greenhouse and urban farm. 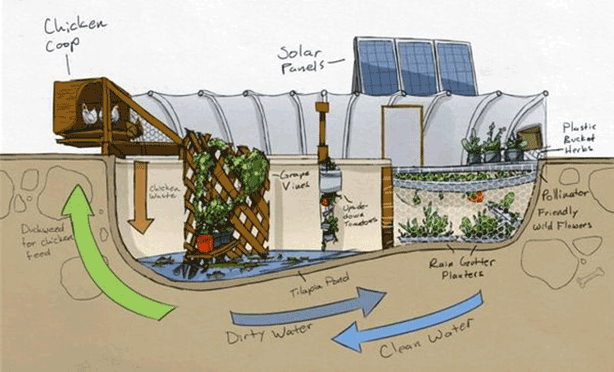 Instead of pouring water–or money–into the pool, they covered it with plastic and began growing food in it. 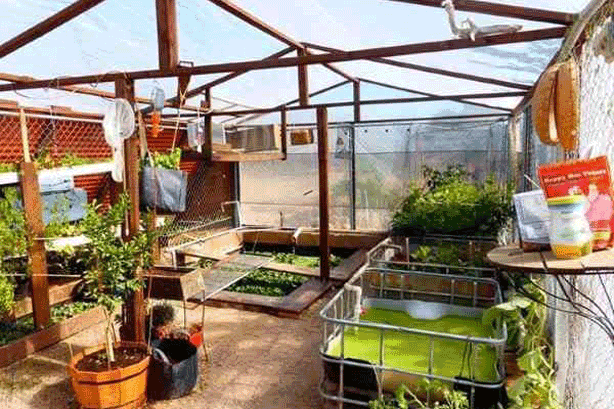 In the middle of the desert, where it’s tough to grow anything other than cactus and succulents, the McClungs created a nearly self-sustainable and high-yielding aquaponic farm using one tenth of the water required for traditional agriculture. 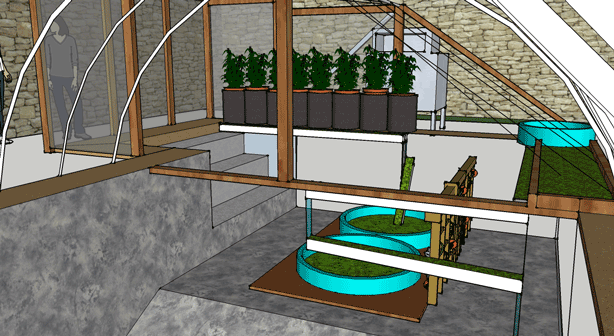 Their backyard Garden Pool is a a closed-loop ecosystem. Rooftop solar panels on the house power the pump that takes water from the fish pond (located in the deep end of the pool) and delivers it to the hydroponic beds, then recirculates it back to the pond. 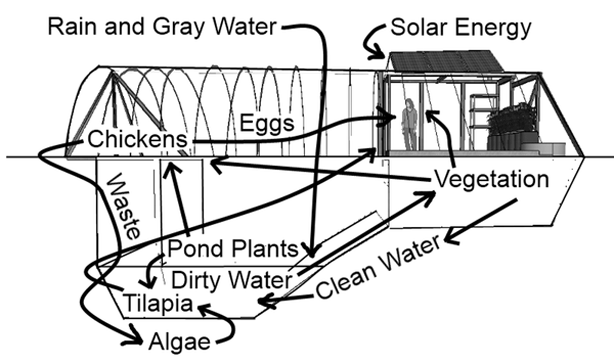 A rainwater catchment system also provides water for the fish pond filled with tilapia and duckweed. After much trial and error experimenting with various unsuccessful gardening systems–including container gardens that scorched in the hot desert sun–they created the Garden Pool system using a combination of methods. 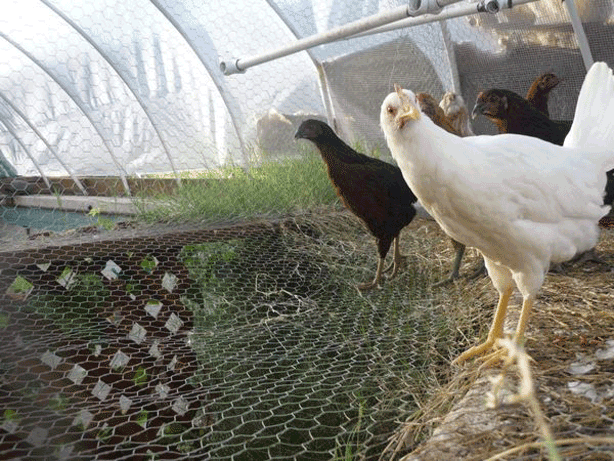 Chicken droppings help make the algae bloom for fish food, while duckweed oxygenates the pond and in turn feeds the chickens. Along with a variety of vegetables, the McClungs discovered that sweet potatoes grow well without soil in the hydroponic beds using a moisture-retaining coconut coir or clay pellet growing medium. The McClungs manage pest control naturally using plants like marigolds and garlic to repel whiteflies and spider mites and ladybugs for aphids. The couple had a bit of experience: Dennis had worked at a dairy farm and at Home Depot, and Danielle was raised on a small Ohio farm. 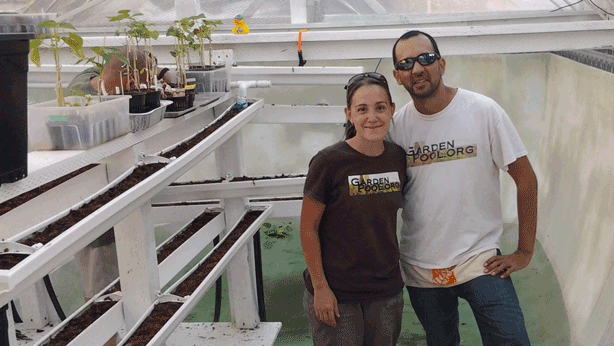 Within a year, the couple had cut three-quarters of their grocery bill and five years later launched a non-profit attracting volunteers, students, and gardeners to build Garden Pools in other locales. Dennis now offers free online tutorials such as “Getting Started in Barrelponics” and “Growing Duckweed” and offers Garden Pool certification. For DIYers, he’s published the second edition of his how-to book, featuring 117 pages of detailed instructions, illustrations and photos, and QR codes linking to video tutorials. In constant motion, Dennis has designed a UV water sterilizer housed in a five-gallon bucket. 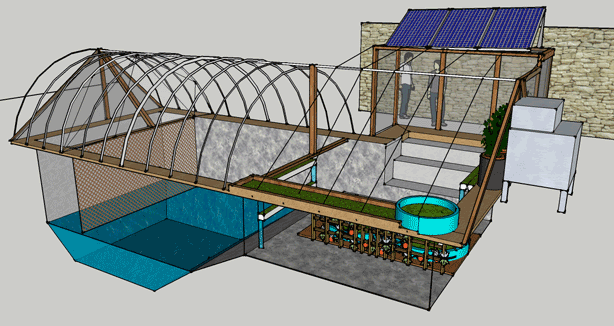 If you’re in the market for a pool-to-farm transformation and aren’t the DIY type, the Garden Pool folks will transform your unwanted swimming hole into a “below ground” urban farm. Even if you don’t have an empty pool to fill, they will dig a pond for you and plant the farm in there. 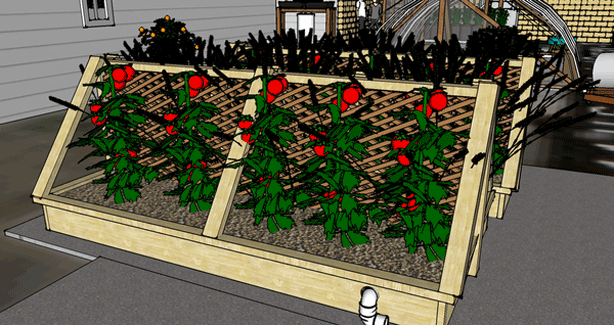 In the meantime, McClung’s mission is to create sustainable solutions to current food production challenges. 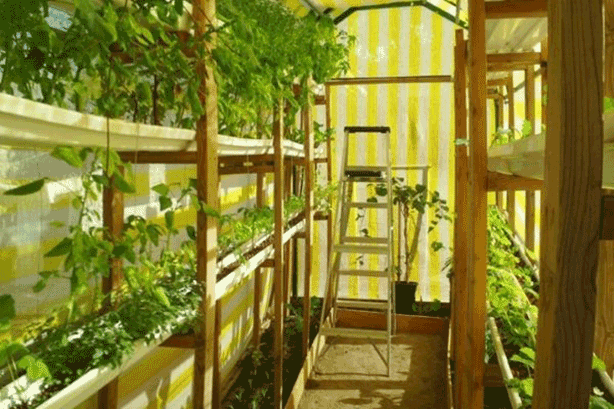 He’s built one in Haiti and now plans to take his miniature self-sufficient food-systems all over the world. Photos and illustrations via Garden Pool.